I'll put it on my bulletin board! The more time I spend in France, the more determined I become to spend more time in France. I keep telling myself, "When I have time, I'm going to learn French," but I think I need to admit that I'll never have time. What I'm going to have to do is MAKE time. At midnight ET, when this post is set to publish, I will (presumably) be in the sky, flying to France. You know what was invented in France? The flying trapeze! Obviously, this calls for a trapezey post. Warning! To those afraid of heights: this is a trapezey post! Okay, *ahem herm* let's get serious. The flying trapeze was invented in 1859 in Toulouse by a Frenchman named Jules Leotard. Guess what he wore? Instead of a net, in the beginning Leotard used a swimming pool. I bet a soaking wet leotard is clammy and cold. And that's all the history you're getting, because I'm about to leave for France and I haven't packed yet and I DON'T HAVE TIME. Here's something that happens to me all the time: someone expresses an opinion, and I have this feeling in my gut that I don't agree, but I can't figure out why not, or how to express it. This is only one of the reasons I'm happy to have smart and articulate friends. If you write or read fan fiction, or maybe even if you don't, you might have noticed the recent explosion of posts on the internets about the relationship between authors and fanfic, especially authors who don't want people writing fanfic about their characters. I've said before on this blog that I don't write fanfic. And I would never read fanfic about my own characters or worlds, for legal reasons and because it could interfere with my process. Please note that if you send fan fiction of my own books to me, I will not be able to read it! Hi there. This is your friendly non-tweeting and non-Facebook-using author here. I was rather surprised to stumble upon a Twitter account in my name this weekend, and even more surprised to discover a Facebook page in my name. I expect there's an innocent explanation for both of these accounts, and I'm looking into it. In the meantime, I just wanted to make sure that everyone knows that those accounts are not me. In fact, my only online presence is this blog, so if you see me appearing in any other guise, then it's not me. In keeping with my blog break, here's a link from "The Big Picture," which tells news stories in photographs -- but I'll warn you that it might break your heart. 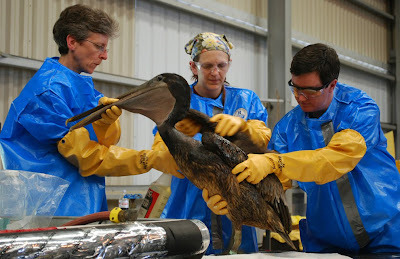 It's photos of what BP's oil spill has done to the Gulf of Mexico. Some of them are gorgeous and all of them are depressing. Here's a preview photo for you. It's not one of the beautiful ones, but it's the one that made me furious. If you've been reading my blog for a long time, you might know why. Thanks to my pal Jen for the link. As you can see, I am very good at taking an enforced blogging break. Like last week's post, however, today's is mostly full of worthy links to other people's websites. Plus, orchid nonsense that has no relevance to anything. I'm still on my blog break, but some things need to be shared. Have you ever read any Alice Munro? I'm not usually a short story reader, but Munro is one of those writers whose collections I can't put down. I just finished The View from Castle Rock, which was as good as a book can get. If you start it and find it's not the thing for you (too memoiry in feel? ), try any of her other collections. Also, the weekend's This American Life contained two segments that pretty much embodied everything I love about this radio show. The episode is called "Return to the Scene of the Crime," and the two segments were Mike Birbiglia's and Dan Savage's. Follow this link to read more and to listen, but beware: This American Life is habit-forming! And now, I will back away from the blog.